While still undecided what form this may yet take I have been on eBay "buying hopefully". One purchase has been a Black Anna, minus its chimney, which might turn out like this. 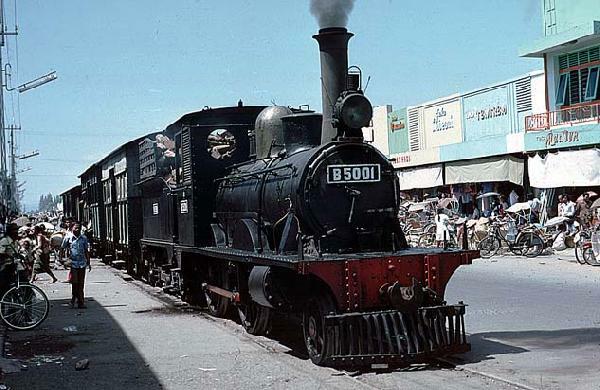 A Hornby 0-4-0T might be the basis for one of these. The coaches look like full-sized kitbashes, particularly the semi-opens in the middle of the train. I wonder if one of these is possible? So far I have a B12 tender to start it off! These pictures come from Roger Dickinson's web-pages "A Month in Java" (to whom due acknowledgement) and date from the 1970s. Meanwhile only time will tell if the resulting models are Javanese or Spanish Caribbean (suitable for Isla Blanca). Could you maybe start with a Hornby or Mainline 14xx chassis turned round? As things have turned out, I've just won a Toy Story train set on eBay with a 4-4-0 loco which may be a starting point for the Sharpie. I'll be interested to see what it's like as it is very toy-like with no valve gear. Still Hornby spares are easy to come across. If it doesn't work for that I'll upscale it to a small loco in 0n30. ... or Tender... not a problem if it's going to be a tank engine. A 4mm tender might fit the bill....really depends on what 'scale' is being used? It's a Sharp Stewart, I believe. 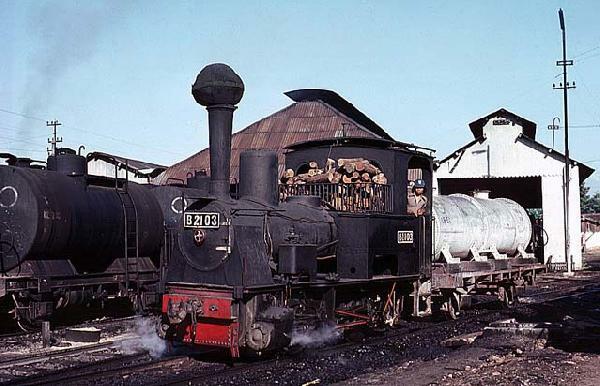 Makes me think of a narrow gauge version of those ex-GER 2-4-0s that lasted into the BR era (E-4 class, were they?) 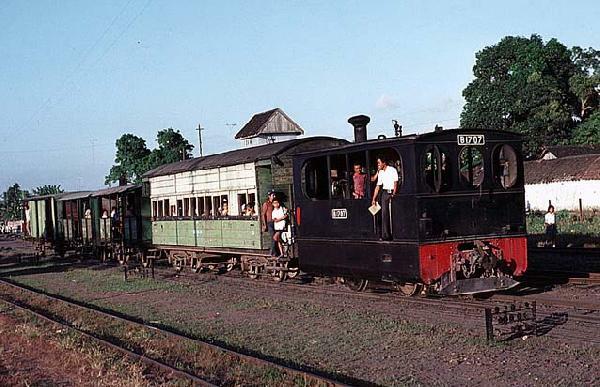 In Java, wood fuel seems to have been standard on the smaller locos at least. There were also some sugar tramways whose locos probably burned slash - I'll have another look at the pictures to check. For a tender I've got a choice - for the Sharpie, the Hornby B12 tender would be very close if the centre wheels and axle boxes were removed, and the wooden rails added, though it might need a little extra body width as well. If the 4-4-0 mechanism isn't suitable (wheels too small, for instance), I'll pair it up with an American style tender which is also in stock and see how it looks as a 3ft ng loco with a larger cab. Or it might stay HO and be used on Lazy River - the least likely option. A lot depends on what comes out of the box! I've used a B12 tender in On30. The body was split lengthways and reassembled with extended front, rear and tank top. A coal load spilling over the latter helped to hide my bodging where it was most obvious while a strategically placed toolbox and heavy weathering disguised the rest. The tender with #3 is the B12 conversion, #5's is an HO scale model but matches the small size of the Porter quite well. Many thanks, Bob. That's exactly the picture I needed, and which has now vanished from your earlier FC Internacionales thread. One of my mental queries was about the width of the B12 tender compared with other 0n30 models - length should be no problem, and I might try to make it a 4-wheeled chassis as that's what the Sharpies in Java had. The other tender I've picked up is a short-wheelbase Vanderbilt type for an oil fired loco, so the front end will need altering for a coal load. As yet I'm not sure what loco it will pe paired with, but the price was too good to resist. BTW where did you get those palm trees? Are they the 19cm ones on eBay? My B12 tender rides on its original chassis, but this has been reversed (to give a wider mounting platform for the Kadee coupling). The extended width of the body was determined by that of the Bill and Ben locos, one of which was the origin of FCPyF #3, but also matches the Peco four wheeled coach. The palm trees are from Fleabay, they're about 12cm tall. I sold the FCPyF a while ago but the same trees have been used on Rio Paleta. More vital information - many thanks, yet again. The Toy Story 4-4-0 and train (Hornby) are on their way from eBay, and I'll be interested to see what turns up. When I've evaluated them for kit-bashing fodder I'll try and post my conclusions in the Product Review section. At the very least there's a four-coupled mechanism and three bogie wagon chassis there, plus an oval of track, but the couplings on the wagons look very odd, certainly not tension lock, which I was expecting. Edit:- Have decided to try to return the set, having examined it; see review in the appropriate section. The bogie coach immediately behind the tram loco in the second prototype photo reminds me of some coaches by (I think) Bachmann; they were in a set with an early American loco in H0. I used to have some , but I expect they're long gone! You're absolutely right. I'd not thought of them as they're HO and I thought they'd be too small for Sn42, but looking at the picture again there's that wide area of planking above the windows that could be used to build up the body height. One advantage with Javanese trains is that every window seems to have a solid shutter and to keep the heat out they're more often closed than open. A carriage with only two windows open was not uncommon - quite a saving if you have to build from scratch. I have a Jouef Tube wagon whiich may form the basis of a look-alike semi-open coach, but the only good shot of a brake van (?) is a bogie vehicle that looks like a goods van. There were 4-wheeled BVs but being at the back of the train they rarely feature in any detail. Whilst the push-along locos aren't much use [unless someone begs to differ?] sometimes one finds a pair of very basic, Germanic origin, 4 wheeler coaches. whilst the underframes/running gear need mechanically...and visually, enhancing, the bodies often show promise......although the plastic they are moulded in seems to be of a quite poor, brittle nature? Only trouble is, they usually appear to be ...nominally, of HO scale...if not gauge. Any advance on the Tri-ang wild west coach? Our local 'cheapo' shops only ever seem to get the type of toy sets with track about TT size and rather futuristic streamline rolling stock. After my rescent experience I think I'll stick to stuff that has better engineering. I did see a Davy Crockett coach on a trader's stand at a show a couple of months ago - only trouble was I didn't know back then that it might be useful. Can't remember if it had a 'normal' or collector's price-tag. I never had one of these in the old days - did have one of those toy trainset four-wheeled coaches. Now they all seem to have vanished too - all on collectors' shelves, I wonder?